I Can Walk Again, My Leg Pain and Limp Are Healed! Dr. Paul and Jessica S.
Dr. Paul Baker has enabled me to walk again without pain and without limping. I developed severe pain with sciatica in my right leg at age 56. The MRI showed 2 herniated discs. Being a nurse anesthetist, many of the nurses and physicians I worked with who had back problems and opted for surgery, some having 2 or 3 back surgeries, resulted in continued back problems. Therefore, I decided back surgery was not for me. I would just live with the pain. 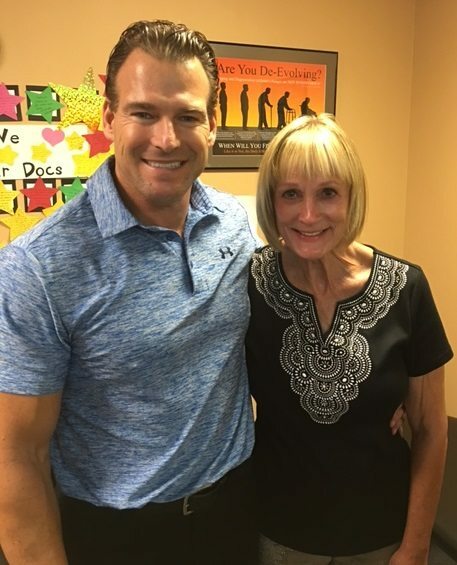 At age 60, I joined BEAT Training and my trainer recommended Dr. Paul. I was very skeptical, but I decided to see if chiropractic treatment would help relieve my sciatic pain. I was completely amazed when my sciatic pain was healed. Then I made a big mistake, I stopped going to therapy once the pain was gone. At age 64, I developed arthritis in my right knee with severe leg pain. My x-rays showed both meniscus torn so I had arthroscopy but continued with leg pain and limping. After suffering for another year, I came back to Dr. Paul Baker. Again, with chiropractic treatment, my leg pain and limp were healed.